Gateways to Brilliance experiences allow us to move from one state of consciousness to the next. It allows us to make a choice, are we moving toward something, away from something or into something. Brilliance is about expressing your most light-filled self and sharing that with the world. It’s a courageous act. When we accept our brilliance, we awaken our sacred purpose and divine potential. We become radiators of love, grace, peace, joy and beauty. For centuries sacred ceremonies and blessings have been used to mark new beginnings and transitions such as weddings, births and deaths. My transformational ceremonies are a modernized version of an age-old practice. I work with light and invite sacred sound to be the vibrational guidance system that transports us through gateways to higher consciousness. We all deserve to feel the richness of a Blessing experience. The purpose is to cultivate conscious environments, both inner and outer, by integrating the techniques, tools and principles of Sound Healing, Feng Shui, Space Clearing, Blessing Traditions, Mindfulness, Meditation and Light that support personal transformation. Transformational ceremonies provide an opportunity for individuals to explore the art of receiving. My clients tend to be individuals that are “Givers” and this is a chance to be a “Receiver” of peace, deep relaxation, love, compassion and self-care. I am blessed to have clients travel from all over the country to experience Gateways to Brilliance transformational ceremonies. Some are new to their journey into self-discovery and the expansion of personal awareness, others have been on their journey for some time and are committed to their spiritual growth. Others are advanced in their spiritual quest and seeking a gateway that will help accelerate their connection to source, oneness and divine potential. After a Spiritual Blessing Ceremony my clients become more radiant and confident, attract joy, happiness and love. They experience profound self-discovery, stress reduction, improved mindfulness, reduction in energy blocks, expanded spiritual enlightenment and blessings. As a Master of Energy, Light, Feng Shui and Sound Healing, I have spent 20 years creating holy spaces, both inside and out. My transformational ceremonies help you ignite the Light within, awaken your inner and outer consciousness, and connect with your divine potential. Give the Gift of Sacred Sound! Consider Carolyn as a speaker for your next large group or event. All Mindfulness programs are highly interactive, engaging, meaningful and experiential. 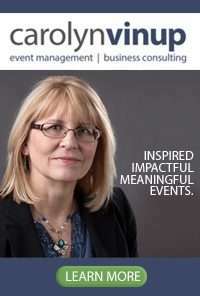 Interested in hearing more about clients inspiring experiences with Carolyn Vinup. Click the link below. I was excited the entire drive to Carolyn’s Blessing Ceremony. I knew that something wonderful, marvelous, something new was about to happen. I actually got lost, although I have known the way to Carolyn’s for years. Carolyn’s energy and enthusiasm was contagious, because I could tell that she cared. She wanted only what the Creator wants for me– and she had offered herself up to be a vehicle for that process. The actual ceremony was one of beauty and grace, where sound become love and love, sound. There was a holiness in that room and a sacredness to the ritual. I could feel myself relaxing into the arms of the Most Holy and being washed gently of my fears and resistance– all that stood in the way of accepting the Creator’s blessings. As Carolyn pointed out, we have all left blessings on the table. Why not ask for them? Why not receive them? Since that session I have felt different, in that I feel more like myself. I sense Grace all the way around. And I’m ready to rock and roll on the joyous ride of life. Whoever you are, whatever your background, age, or religious background, there are blessings for you to gather, like flowers to your heart. My session, Gateways To Brilliance -The Blessing, with Carolyn Vinup was deeply relaxing. As the sound and vibration of her voice, chant, and crystal singing bowls flowed through my body, I felt a sense of releasing and lightness. As the session progressed, I could see light coming in waves tuning and harmonizing me on every level. Several times I had images of geometric shapes and felt a spiraling, tingling sensation. At one point, she guided each hand inside one of her crystal bowls and the palms of my hands felt a warm flow in and out. I thought about the blessings coming in and going out in many areas of my life. After our session, I felt cleared and recalibrated. It was such a gift! I highly recommend this healing sound session with Carolyn. The Blessing was one of the most sacred ceremonies that I have ever experienced. From a purely physical standpoint it eradicated my stress and I was washed with love and light. From a spiritual standpoint, concepts of “God” and “Light” were transformed to “Being”. Carolyn Vinup’s “Blessing” gently and lovingly escorts you to heaven and brings you back having a new definition of “Bliss”. In the days since my experience, I am more grounded, present and aligned with my Source. A feeling of being special, just because you’re you. An exercise in moving into a receiving state that feels so graceful and fluid, that you find yourself there before you even realize it.